PS4 Firmware v3.00 is now officially available to download as of earlier today. The update is a major one, adding lots of new social features to the console, including Events, Communities, and adding comments to the “What’s New” section. You can now also stream live to YouTube, and post 10-second video clips to Twitter. Check out the full changelog here. Its worth noting that the final version of Firmware v3.00 is almost exactly the same as the beta version, but we have noticed an addition to the final version: the ability to login to a PS4 as a guest using the PlayStation App. (Events) has been added to the function items. All events associated with PlayStation® are now brought together, enabling you to discover, participate in and watch these events in a centralised area. 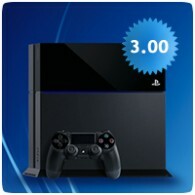 (PlayStation®Plus) has been added to the function items. You can now see all of your PlayStation®Plus benefits, such as free monthly games, exclusive discounts, news and more, in one place. You can now easily log in as a guest using PlayStation®App available on smartphones and tablets. To log in as a guest, simply use the camera on your device to scan the numbers shown on the TV.